Welcome to Affordable Beach Condos, a most unique and charming water front hideaway. In this listing you will see availability and rates for a two bedroom condo. (We also have less expensive one bedroom condos and a three bedroom three bathroom Executive House - contact us for more information). The two bedroom Florida Suite has a queen bed + two single beds + a sleeper sofa. Sleep 5 adults (one on the sleeper sofa) or four adults in beds and two small kids on the sleeper sofa. There is a full kitchen, living room with dining area and a back patio. Heated pool, Fishing Dock and BBQ. Affordable Beach Condos is a unique Boutique Oasis in the heart of Paradise. Every delightful condominium has a theme! At Affordable Beach Condos the ever-present Island breezes will blow your cares away. Revitalize body, mind and spirit. Set amid lush waterfront tropical gardens that are abundant with palms, tropical plants and fountains. Affordable Beach Condos oozes charm and character. The property is a Florida Heritage property - a blast from the past from a bygone era of Old Florida that offers our guests a unique vacation experience. The individual condos each have a unique decorative motif from around the world. Experience Africa, Hawaii, England, the Orient etc. Updated all ground floor condos with a full kitchen, full bathroom with a tub and shower and separate living/dining room. Clean with heating and air conditioned. All the appliances, linens and bedding included. Luxuriate in the calm waters of Treasure Island. Fish from our dock, feed the pelicans and herons or just lie pool side by our year round heated pool and look for dolphins and manatees. A short and easy walk to the beach, shops and entertainment puts all the attractions of Treasure Island are on your door step. We are on a tropical island in the heart of the Gulf of Mexico. Surrounded by water on all sides. Our Backyard is dolphin alley where dolphins can be seen year round..
Spa and Retreat Facilities: Affordable Beach Condos offers a vacation beach experience with affordable, well appointed condominium rentals. Heated Pool, Fishing, Beaches, Sun Shine! Close to the sophisticated life style of St Petersburg and Tampa. Treasure Island is very laid back. Think Ernest Hemingway's Old Florida with live blues bars, great sea food restaurants and informal island life. Nothing represents the character of this bygone era better than Whispers Affordable Beach Condos and nearby Johns Pass Historic Village. Johns Pass Village is just up the road. A shanty fishing wharf filled with eclectic seafood restaurants, small galleries and shops, and where the daily catch is still brought home each evening and cooked fresh for you right off the boat! Close by are many fine restaurants, both fast food and fine dining. Fishing charters, boat and jet ski rentals, para sailing and the best white sand beaches in the USA! St. Petersburg and Tampa have many fine cultural events, music, museums, sophisticated dining, galleries and amazing bars and pubs. Dont miss the Saturday Art Walk. Every second week, free trolley tour of the art district with live demonstrations of pottery making, glass blowing, works in progress and art galleries. Every month brings a host of different events. There are world-class symphony concerts, theater, experimental theater, rock concerts, and fine museums including the world-renowned Salvador Dali Museum, the Holocaust Museum, as well as the finest Museum of Science in the Southeast. We are the regional capital for craft beers, brew pubs, live entertainment and amazing night life. The thrill rides of Busch Garden Theme Park and Adventure Land are a must and are just forty five minutes away. Disney and Universal are 90 minutes away. Do not miss the Seminole Indians Hard Rock Casino, Lowrey Park Zoo, Tampa Aquarium, Winter the Dolphin star of Dolphin Tales at Clearwater Aquarium, and of course the finest beaches in the USA! Old historic downtown Tampa is Ybor City also known as Cigar City. This is the old Cuban cigar-making district that gave the world Tampa Cigars. Today it is reminiscent of New Orleans' French Quarter with its Jazz clubs, Blues bars, rave clubs, taverns, bistros, and boutiques. Rock until you drop is the theme of Ybor City. Three major malls are within 30 minutes plus a huge Factory Outlet Mall featuring major brand close outs. Discover little treasures in the small boutiques around Treasure Island Village. We are waiting to welcome you to beautiful Treasure Island on the Florida Gulf Coast. Home of the finest beaches in the USA. Famous for 360 days of sunshine a year! 'Affordable Beach Condos' has it all, for everybody, young and old alike. Like many of our guests, who come back every year, we hope that you will too. We would love to welcome you! RATES SHOWN ARE A GUIDE ONLY. NOT ALL RATES CAN BE SHOWN IN THIS ADVERT. RATES ARE SUBJECT TO CHANGE BASED ON SEASON, AVAILABILITY, UNIT SIZE. RATES FOR HOLIDAYS AND PEAK SEASON MAY BE HIGHER. Additional Services Dogs Allowed - fee applies. indicates maximum number of Adults and small Children under 12 years of age allowed - based on the published rates. (An Additional 3 persons OF any age can be accommodated. One person in the sun room off the master bedroom and 2 in the sun room off the living room which is semi private). Subject to prior approval for more than 8 people. Additional charge per additional person. Sharda and I take great joy in this unique property a - piece of Florida's heritage! On the bay where the beach meets the bay. Courteous and friendly. When you are here you are at home. HERE IS THE EXPERIENCE WE AIM TO PROVIDE FOR YOU: Think Bee Wop a Doo Dah. Think 60's retro with unique themed condominiums in a small private Florida jungle retreat. Take a break from the large, faceless, Mc Hotels. At Whispers you will NOT lose your family between the lobby and the pool! This is old time Florida. Escape the swarms of strangers, crowded pools and relax in the ambiance of a more genteel environment. Lush jungle gardens and huge trees to shade you, and cool breezes fan you by the pool. Does this sound right for you? Then you will love a Florida Heritage vacation, a blast from the past. The Bee Wop a Doo Dah. We will take you back to the days when the family piled into Dads Buick Roadmaster 'Woodie' and headed south for an adventure to the pristine beaches of the Gulf of Mexico. Relive an era before the large 'Box Hotels' popped up on every corner. Before McDonalds. An era when the corner soda shop was the place to hang out! This blast from the past has just 8 units set in a lush tropical garden. Every unit has a unique themed decor, such as Oriental, Africa, Hawaii, England etc. This is real honest to goodness American apple pie, old time, down home Florida with all its eccentricities. Whispers is a very small and extremely private bay front property. Lose your cares. Feel human again! Your patronage helps us preserve our Vintage Florida Heritage. The property is updated while still preserving the essential elements, colors and feel of our Florida heritage. FANTASTIC PRIVATE LOCATION This Affordable Beach Retreat is in a fantastic and quiet, gated, location. PRIVATE RETREAT: You can have 20 - 30 family and friends for a perfect get together with units of varying sizes. It will be your own PRIVATE RETREAT! GREAT LOCATION: IN THE HEART OF TREASURE ISLAND Walk one block to the shops, bars, restaurants and supermarket. Close to downtown St Petersburg. 15 minutes to sophisticated nightlife, micro brew pubs, multicultural dining, theater, arts, music and craft galleries, to name but a few. NATURE AND SUNSHINE You will love being on our part of beautiful Boca Ciega Bay known as DOLPHIN ALLEY and for good reason! Dolphins pass by daily. Pelicans, egrets, herons and sea birds frequent the dock. Excellent fishing from our dock. Boat docking. THE # 1 BEACHES IN THE USA! GREAT AMENITIES Water front heated pool, a boat dock, a fishing pier overlooking a large bay with great opportunities for dolphin watching. BBQ waterfront. THINGS TO DO: GREAT DINING, EXCELLENT FRESH SEAFOOD Within a block you can visit the local shops and boutiques. Fast food to top end dining. Enjoy local bars with live entertainment. The 60 mile Pinellas Bike and Hike trail passes outside our front gate. Rent or bring a bike! Jet ski, boat and paddle board rentals. Deep sea fishing charters. Dinner cruises and dolphin watching adventures. Two blocks to the beach boardwalk Catty Corner to a public park. Close to St. Petersburg / St. Pete Beach / Tampa / Madeira Beach / Indian Rocks / Fort de Soto / Orlando. Close to Tampa Airport (TPA) and St. Petersburg (PIE) Airport - 18 miles. NEARBY: Enjoy nearby historic Johns Pass Village (one mile). Experience the fabulous fresh seafood off the boats. DISNEY, SEA WORLD, UNIVERSAL - 90 minutes LEGOLAND and BUSCH GARDENS - 45 minutes KENNEDY SPACE CENTER - 2 HOURS. 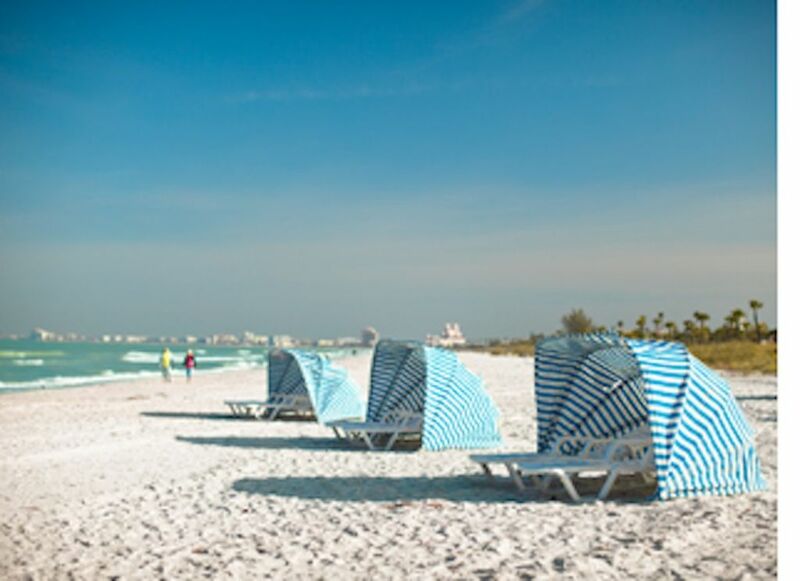 Treasure Island and the surrounding beaches are home to the # 1 rated Beaches in the USA! This two bedroom condo sleeps 2 to 6. One queen, two singles and a sleeper sofa for 2 small kids or one adult size person. All our condos have full kitchens and living rooms If you have a larger family: There is a 3 bedroom 3 bathrooms waterfront house with a gourmet kitchen. Soaring cathedral ceilings. Loads of upgrades - sleeps 8. Lie in the shade of the largest rubber tree on the island. Relax with a book, catch the perfect tan and watch the pelicans and egrets and hundreds of types of birds or the dolphins in the bay. Fish from the private dock and have your catch on the pool side BBQ for dinner. Overlooking a large pristine bay look for dolphins and manatees from our secluded pool patio with a gorgeous view of the bay. Sharda and I appreciate it. Thank you for leaving the condo in a great condition and we hope that you will come and see us again in the near future. Very clean and close to everything. The owners were very nice and friendly. They were on-site everyday cleaning and making sure everything was ok. I would recommend this place to anybody looking for a clean, quiet place to relax and enjoy their vacation. it was a great pleasure to meet you and your boys (and the pup)! All of whom were very polite and well mannered. Thank you so much for your kind review and for leaving the house in a good condition. We appreciate you and thank you for staying with us. We look forward to your future visit. Loved our room! Great location to shops, restaurants & beach. Pool & dock were fun! Thank you for your kind review and for staying with us. We look forward to welcoming you back, hopefully soon. We loved having you and your pups were great. Thanks so much for keeping the condominium so clean - we appreciate considerate guests like yourself. My wife and I stayed at Whispers for two weeks in May. Whispers was the perfect home away from home, clean, neat condo with a Hawaiian theme and just a 5 minute walk to the Beach on Treasure Island. The location was fantastic and for that alone it is worth considering. We found it to be good value as well. The property was very quiet and no loud teenagers or parties. Guests were very respectful of each other and very friendly and we had pot luck dinners water side with several of the guests who soon became our friends. Jeffrey and Sharda were very nice and helpful. Sharda met was very informative about things that may be of interest happening in the area which we really appreciated. We would definitely return to Whispers next time we visit. I remember that you all got along with the other guests and your pot luck dinners at the pool side. You had a small portable fire pit and it was very magical. That was a nice touch. I am happy to have hosted such a merry crowd of nice people and I thank you all for being so caring and respectful to the condos. I understand that you have planned to all meet up next year at Whispers? It was a great experience !!! It was a great experience, Beautiful condo, so neat and clean. The pool and the beach are just stunning... Finally, the host was awesome and very helpfull. We will definitely consider this condo in the future. Thanks so much for your kind words. We enjoyed having you stay and we appreciate that you left the condo so clean. Holiday and Seasonal Weeks are extra. Dogs Allowed - fee applies. A short stroll puts you right in the heart of Treasure Island Village. Here are the little delis, ice cream parlors and restaurants, the tiki bars on the beach, the one-of-a kind boutiques, and cafes, and of course the ubiquitous little seaside shops with their sponges, shells, and sunscreen lotion. Walk a mile to Historic Johns Pass Village for fresh sea food off the boat! Total privacy and quiet and yet you can walk a block or two for every convenience you may need. At days end there is nothing finer than relaxing at Whispers under the Old Rubber tree!